They say money can’t buy you happiness, but it can certainly spring for a beautiful bouquet of flowers, and if you are looking to attract a little wealth and abundance your way there is no better flower than the waxflower. With the wordy Latin name Chamelacium uncinatum, the waxflower, sometimes called Geraldton Wax as well, has the look, feel and smell of refinement and luxury- but doesn’t cost an arm and a leg to fill a vase. In the Victorian language of flowers it is said to represent riches, and one can’t help but feel patrician with a few stems nearby. 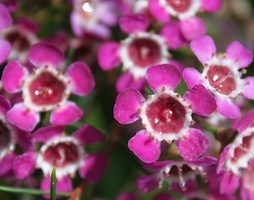 Native to parts of Austrailia, the waxflower grows as a small, woody shrub with finely feathered, needle-like leaves similar to the local tea tree and reminiscent of heathers. In the same plant family as the myrtles, the leaves and stem have an aromatic quality that is faintly citrus and refreshing when touched. The woody stems and narrow and gracefully branched, each ending with a wealth of flowers on top. In deep fuchsia, light pink and sometimes available in white or light yellow, the flowers are each so perfectly formed as to almost not look real. While the stems and leaves have a pleasant smell, the flowers themselves produce very little scent or pollen, which makes them a great choice for people with allergies or other sensitivities. With five curved petals that look carved by hand that radiate around a central cup from which one dainty stamen protrudes. It is hard not to find oneself staring and wondering how something so symmetrical, so small yet shapely, exists in nature. Money might get spent, but true wealth remains, much like the waxflower that will look fresh and new in a vase for up to a month. To make them last as long as possible, strip the tiny leaves from the bottom of stems that go into the water and change the water at least once a week. This ability is one of the reasons why the waxflower is associated with long lasting success. Waxflower is available all year long at your local florists and are becoming more popular and in demand. While dark pink is the most common, new cultivars are starting to sprout up in purple. Sold in bunches with stems that can be divided and separated into individual pieces, making just a little go a long way. While there is no guarantee this flower will bring you any money, it can sure save you a lot of dough.